The University of Medicine and Pharmacy at Ho Chi Minh City has selected Editorial Manager to manage submission and peer review for MedPharmRes. Penn State University Press has chosen Editorial Manager to support submission and peer review workflow for three newly launched journals–Resources for American Literary Studies, Dickens Studies Annual: Essays on Victorian Fiction, and The Eugene O’Neill Review. The press now has over fifty titles using EM. The Journal of Bone and Joint Surgery and the Journal of Bone and Joint Surgery Open Access have begun soliciting contributor roles on an optional basis using Editorial Manager’s CRediT integration. Learn more about CRediT. The 10th Annual Open Access Week has arrived! Editorial Manager users can celebrate by visiting the Transparency Tools video library, where features to support OA workflows are on display. Learn more about how integrations and features such as discussion forums, ORCID, CRediT, and RightsLink for OA® can help support your OA workflow. Plus, visit the Open Access Week website and participate in OA week discussions on social media using #OpenInOrderTo. 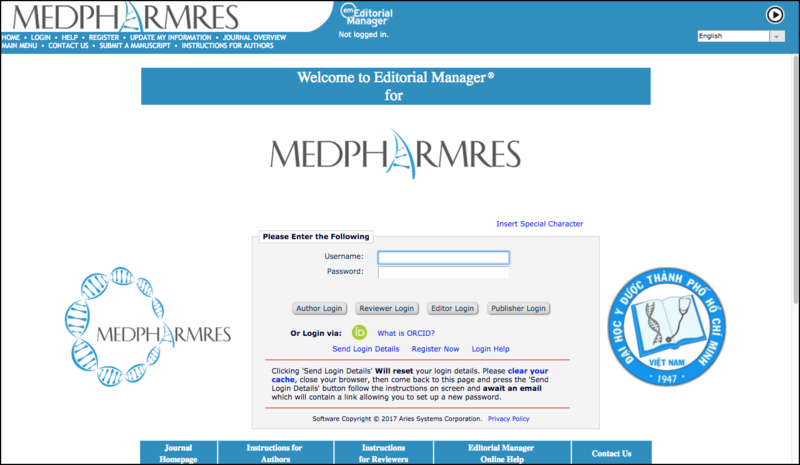 MA Healthcare has implemented Editorial Manager’s RightsLink for OA® Integration for three of their journals–the British Journal of Hospital Medicine, the British Journal of Nursing, and the International Journal of Therapy and Rehabilitation–with more journals implementing in coming months. 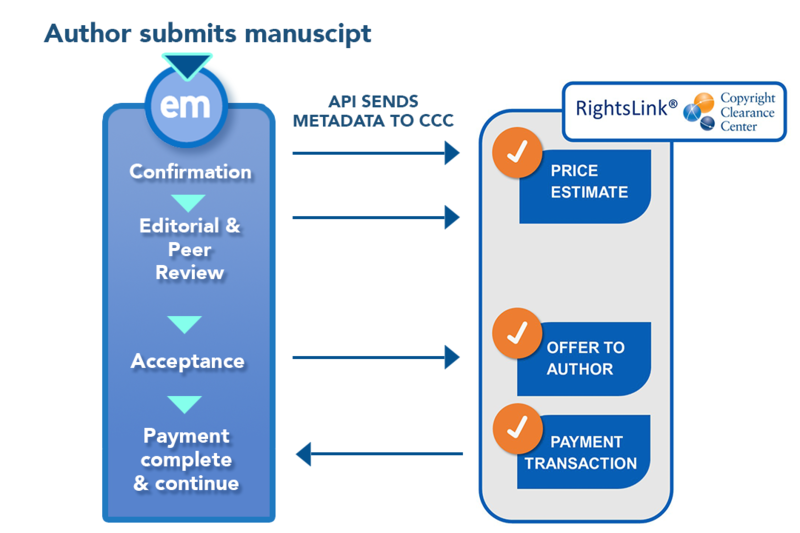 The integration streamlines APC workflow for authors and editors. Watch the video to learn more. 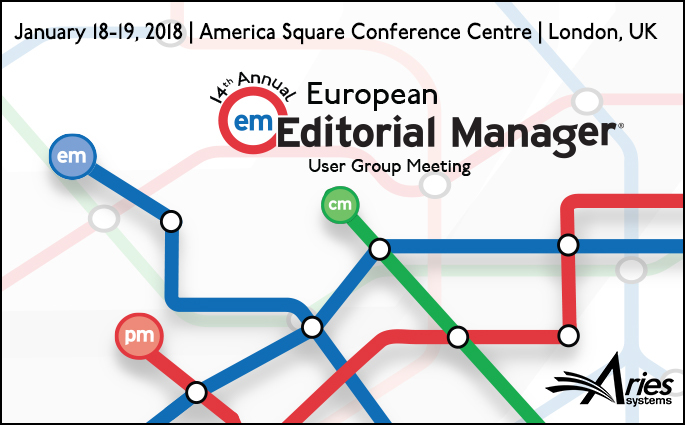 Registration is now open for the 14th Annual European Editorial Manager User Group Meeting (EEMUG). Join us at the America Square Conference Centre in London on January 18-19, 2018. EEMUG 2018 will feature sessions on the importance of XML, ethics and integrity tools, and more. Review the full agenda. Register at a discounted rate before December 11, 2017! Aries is pleased to announce the addition of new EM Ingest partner, Edanz. Edanz is a globally recognized author services company that provides English editing, educational materials and workshops, and other expert services and products that help authors understand the publication process and communicate their research clearly and effectively. Koji Yamashita, CEO of Edanz, says of the partnership: “I am very pleased to partner with Aries to provide more seamless writing and submission experiences for authors, to achieve Edanz’s mission of helping researchers succeed.” Read more about EM’s Ingest Service or view the full list of Aries partners. Taylor & Francis recently added 24 journals on their branded submission portal, including for the International Journal of Crashworthiness and Ships and Offshore Structures, in addition to others. Using a custom, T&F-branded user interface along with Editorial Manager’s Ingest Service “behind the scenes” to ingest files and metadata to journal queues for submission and review by editors, T&F are able to curate the author experience directly. “Authors only need one username and password to access all new submissions to Taylor & Francis journals,” said Siobhán Aldridge, Submission Systems Analysis Manager at T&F, “and feedback from users has been extremely positive due to the speed and ease of submission. See the Future of Manuscript Submission: New Interface, New Video! A newly released video previews version 14.1’s manuscript submission interface with metadata extraction. Visit the video library to see how Editorial Manager is reducing the amount of work authors need to do in order to get submissions off to journal queues.